On Saturday, February 10, 2001, three generations of Gordons set out to claim their quarry, the degree confluence at 32° N 109° W, about twelve miles north of Rodeo, New Mexico. Don Gordon, my father, is a native Arizonan who likes to go prospecting for a hobby, so he has done his fair share of hiking around mountains in the desert southwest, but never before to search for a degree confluence! I was the driver, and I took my two sons with us, Daniel and David. The boys liked the sound of this outlandish hunting adventure. They were eager to go with me and their Granddad to find the confluence, hopefully, and perhaps get their names and pictures published on the Web site. 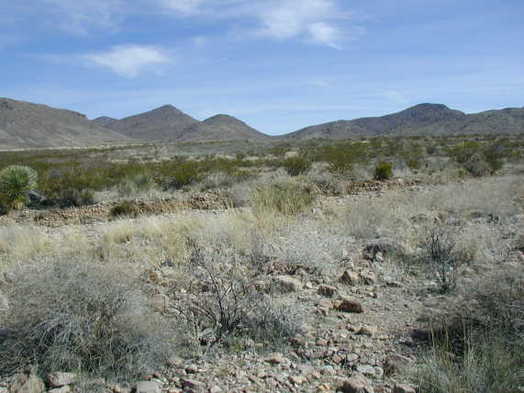 The location of this confluence is a fairly remote spot in the high Chihuahuan Desert not far from the Continental Divide, which meanders all the way down to the southwestern corner of New Mexico. We set out early in the morning, loaded up with essential provisions like the chocolate chip cookies that Grandma had baked. From our hometown of Sierra Vista, Arizona, we drove 125 miles, past the cities of Bisbee and Douglas along the southern border of Arizona and near the international border with Mexico, and on across the state border into New Mexico. After passing the small town of Rodeo, NM, heading north on Rt. 80, we started to monitor our coordinates on the GPS receiver. We passed a sign that read "Big Cat Ranch" and it looked like we were as close as we were going to get to our target from the highway. We started to look for an off-road that might get us closer to our destination, which appeared to be about two miles east of the highway. As we turned down a dirt road named Patty Lane we noticed a jackrabbit with one lame hind leg. He was so pathetic-looking as he tried to limp away on three legs that we couldn't suppress some laughter, and I said, "That's about as funny as a three-legged jackrabbit!"" Not far from the highway we hit a dead-end, inhabited by a small trailer park and a mean-looking dog that looked like a cross between a Rottweiler and a St. Bernard, with a mouth big enough to swallow my left front hubcap. We turned around, headed back a bit, and then pulled off the dirt road and decided to start walking. It was a splendid mid-winter day. A thin layer of high clouds helped to filter out the burning rays of the sun; in this part of the country, sunburn is always a possibility, no matter the time of year, so the clouds were welcome. It was perfect weather for hiking, with temperatures in the mid-sixties. We climbed over, through, and under several barbed-wire fences. The land around there is divided up into small ranches of about forty acres each, and many ranchers were raising cattle. Luckily, we didn't see any "No Trespassing" signs, which might have scared us off at that point. We crossed a large field of tall, golden grass, and I almost stepped on a small, surprised rabbit, but it managed to dart off untouched. We were surprised when we found another dirt road that we hadn't seen before. On foot, we followed the dirt road to the north, since that moved us closer to the target. We were able to get far enough north, but we were still about a mile and a quarter too far west, so we stepped off the road and started to follow a dry wash up into the foothills of the Peloncillo Mountains. The hike wasn't overly difficult, but ended up being much longer and a steeper climb than we had imagined. We were beginning to wonder whether it would have been better to find the dirt road with our truck and just drive up the hill. Oh, the conveniences of modern technology-my four-wheel drive Jimmy would have been able to negotiate the bumpy, hilly road without a problem; and it would have also hauled up, like a faithful old mule, all our sandwiches and cold drinks, too, which we were beginning to long for. We hadn't packed them into my backpack, thinking this was going to be a quick little walk. Our hike led us through the rocky, gently sloping foothills of the Peloncillos. The hills are covered with orange and pink rocks, which reminded me of pictures I have seen of the surface of Mars. The flora was predominantly creosote bushes, with some scattered barrel cactuses, many patches of prickly pear cactus, and yellow Mexican poppies that were in bloom. Other wildflowers were budding, but not yet in bloom. Sporadic agaves and yuccas accompanied some ocotillos, which were conspicuous due to their more rare occurrence. Finally, after hiking for over an hour, we located the degree confluence. It was located on a spot near a diminutive barrel cactus where the foothills were starting to fold into more serious ridges. The views to the north, east, and south were uninspiring, since the ridges and mountainside obstructed the vista. However, the view towards the west was spectacular. We beheld a wide panorama of the east side of the rugged Chiricahua Mountains, glistening white and blue with recent snowcaps. I started to take our pictures of the GPS receiver that proved our location, and took some shots of the four main compass-point directions from that spot. Then I set up the tripod so we could take a group shot with the breathtaking Chiricahuas as a backdrop. We marked a wooden stake with the coordinates and the date, and drove it into the ground. We started back down the mountain, happy and thankful that our expedition had met with success, and anxious to get back to our sandwiches and homemade cookies. We wondered if there would ever be a second confluence-hunter to visit this location, and we thought that there probably wouldn't be for a long time. Then we started to plan our next confluence expedition.